Elon Musk gave SpaceX fans a rare glimpse of the parts used to build his massive rocket that could one day send humans to the moon and Mars. 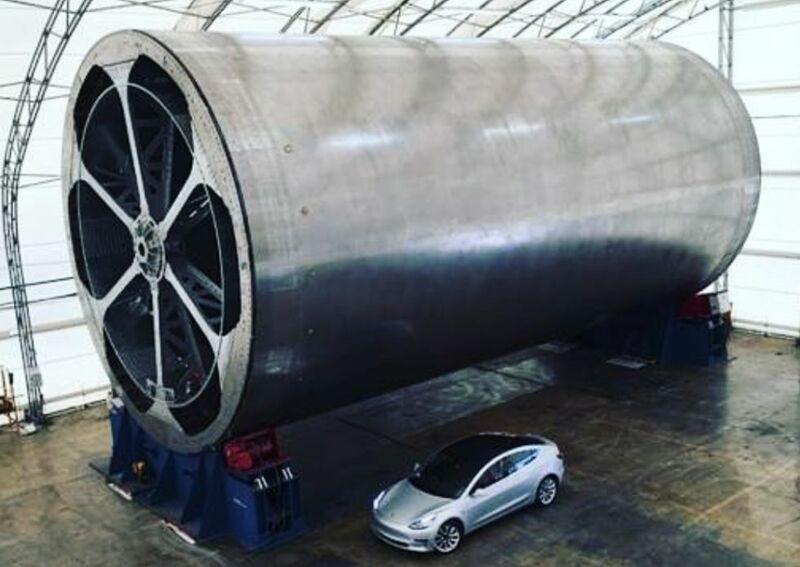 The billionaire tech mogul shared a photo on Instagram late Sunday that shows off the main body tool used to build SpaceX’s ‘Big F***ing Rocket’ (BFR). The massive device is used to build the rocket’s fuselage, or upper stage. It’s essentially a turning mandrel around which ultra-light carbon fiber is woven to form the main section of the BFR. In the photo, Musk cleverly placed a Model 3 sedan next to the main body tool to illustrate its enormous size. The Tesla chief doesn’t typically show off the hardware use to make his rockets and, in particular, SpaceX hasn’t shown many photos of the BFR being constructed. Musk in 2016 displayed the BFR’s fuel tank, which can store up to 1,200 tons of liquid oxygen, as well as some video footage of the rocket’s raptor engines. At nearly 348 feet tall, the BFR is a truly gigantic spaceship, towering over the 229-feet-tall Falcon Heavy rocket. The spaceship will take off and land vertically, powered by 37 ‘raptor’ engines, to produce a liftoff thrust of 5,400 tons, lifting a total mass of 4,400 tons. As expected, Musk has set out an aggressive timeline for when the BFR will be ready for takeoff. ‘We are building the first Mars, or interplanetary ship, and I think well be able to do short trips, short up and down flights, by first half of next year,’ Musk said at the South by Southwest technology and culture festival in Austin, Texas, last month. ‘Although sometimes, my timelines are a little, you know…,’ he joked. However, the target may not be too crazy, as SpaceX president Gwynne Shotwell has said first test flights could take place in 2019. Orbital tests could be held in 2020 and, by 2022, SpaceX could deliver the first cargo to Mars, Musk has said. The rocket will take satellites to orbit, crew and cargo to the International Space Station and even lead manned missions to the moon and Mars. The BFR plays into Musk’s belief that humans need to become a multi-planet species in order to survive, eventually colonizing Mars and developing a base on the moon. In order to land on Mars the rocket will have a propulsive landing method – similar to the one used by Falcon 9. Musk first revealed his plans for a future moon base back in September. The top part of BFR rocket has 40 cabins, which could hold 5 or 6 people. ‘This will enable the creation of a lunar base. It’s 2017 – we should have a lunar base by now,’ he said at the time. Musk said the successful launch of the world’s most powerful rocket, the Falcon Heavy, has given him confidence that the BFR can come to fruition. In February, SpaceX completed the historic launch of its Falcon 9 megarocket. ‘Most of our engineering resources will be dedicated to BFR and so I think that will make things go quite quickly,’ Musk said.